Queen's University was established in Kingston, Ontario, Canada, in 1841 and is duly considered the ‘Princeton’ of Canada. It is a top-tier public university, famous for excellent teaching quality and an intriguing history. The teaching quality of Queen’s University enjoys its excellent reputation not only in Canada, but all across North America. Together with the University of Toronto and McGill University, the three schools form the evergreen league in Canada. 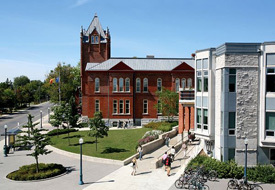 According to Queen’s University’s official website, the academic grants annually received by the school surpass any other institution’s. Additionally, Queen’s University is dedicated to various international education endeavors and has 91 partner schools around the world.